First-time visitors to the "Operation Archive" website often tell us that they were surprised and delighted at the historic books and DVDs we offer. "Never thought I'd be able to have a copy of this!" people write to us, or "Thank you for making this available again! I haven't seen this since I was at the Air Force Academy!" It's no co-incidence that our website catalog contains obscure, hard-to-find, and in some cases entirely unique books and DVDs. That's the whole point. Periscope Film's "Operation Archive" was created out of our desire to preserve history. The starting point was back in the late 20th Century, when we became aware of the fact that our own government was disposing of 16mm military training films from the 1940's, 50's, 60's and even 1970's en masse. They were throwing them away or, in some cases, actually incinerating them. While the government felt these training films were obsolete, and of no value, we recognized that they contained important historical scenes, many of which were unique and irreplaceable. Our first acquisition incidentally, was a set of rare films related to the United States Submarine Service -- hence the name Periscope Film. (We're proud to say that we now have the largest and most extensive library of historic submarine film prints in private hands.) These films, which chronicled the journey of the Nautilus and the exploits of the submarine fleet during World War II, narrowly missed ending up in a landfill. Once they were in our hands, we felt an obligation to look for other films that were endangered. Soon we had a terrific collection, spanning all branches of the military and covering seven decades of history. Once we began to assemble a library, we became aware of another grim fact. Namely, that even though we'd saved these rare films from destruction by the bureaucrats, a lot of them were self-destructing. That's right: a lot of these rare movies were in a chemical tailspin, on the verge of literally turning to dust. So, we began to educate ourselves about the best way to stabilize these films, and make them available for future generations. One way to do that involves chemistry. Another method, of course, is to put them out on DVD. As of 2009, Periscope Film LLC has accumulated over 3000 rare films chronicling the history of the Navy, Marines, Army, Coast Guard, Air Force, and civil aviation as well. Although we now have over 40 DVD titles in print, if you do the math, we have a lot more films to re-issue and we are working tirelessly to make them available to you. 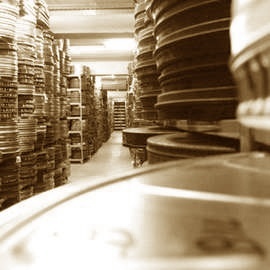 Over the years, we've also made films in our archive available to documentary filmmakers, website and game developers, and for commercial use. Some of the companies or networks we've provided stock footage for include Disney, the BBC, the History Channel, Discovery and PBS. Thanks for reading about our little company. We appreciate your support, and your business, and we're excited to make all of these high quality historic films and documents available again. What about your military manuals and books? In 2006, we also began publishing out-of-print military manuals, pilot's flight manuals, and rare books. Some of these, like the Navy's Fleet Type Submarine Manuals, are items which have never been available to the public. Others are simply things that, while you might have found them for sale, were considered rare antiques and virtually untouchable in terms of cost. At the urging of a couple dedicated veterans and a museum or two, we laid the groundwork to go into the book publishing business, and it's been growing ever since. We like to think that one of the reasons our customers love our books and manuals, is that we've taken the time to work with printers to produce high-quality reproductions, with heavy-weight paper and full color covers. Most of them are a very readable 8.5x11", and in some cases we've blown up books with tiny, unreadable text and made something far more readable than the original. "Why don't we put out PDF files and make electronic books? ", you might ask. Well, call us old fashioned, but isn't it nice to have a book in your hands, and have it handy on your bookshelf? Plus, who wants to give a CD as a gift? What makes your DVDs different? 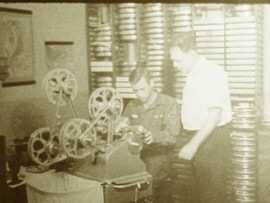 Telecine (transfer of these old films to video) is critical to the quality of any DVDs. Many vendors use a low quality method of transfer, that has a lot of noise and poor-quality color. Then, they use very high compression settings when creating their DVDs, which makes the image look even worse. We use only professional quality telecine vendors, and we work hard to eliminate video artifacts. Case in point: while another vendor came out with "The Air Force Story" on DVD, they compacted 27 episodes onto one DVD. We put it out as a 3 DVD set, precisely because it looks better. A lot better! Mothers lie – looks are important! So, just this past year, we redesigned all of our DVD packaging. Designed by talented artists, we use four color printing on the DVD box and matching four color printing on the DVD itself. You will be proud to put these DVDs on your self and to show off to your friends. We're not the only company who puts out historic films on DVD, but we are the best. The reason is our content. While the other guys offer a grab bag of films on their discs, we take the time to carefully select films for each DVD. Sometimes we even ask veterans and historians for their advice! The result is, you get a disc with set of related films, that feel "complete". We organize the films in a fun and clear way, so that each DVD has a thru-line. At Periscope Film LLC, we want you to buy our products and be happy with that purchase. We're proud to offer a 14-day money back guarantee on everything we sell. If you have a problem, simply write to us within 14 days of your receiving your items. If we cannot correct the issue to your satisfaction, we will be happy to take back the item and refund your money minus the original shipping cost. We don't believe in handling fees or outrageous restocking charges -- that's not the American way.